Every day leading up to Valentine’s Day this year, The Key is recapping 14 songs that scream “love” just as strongly as they scream “Philly.” The Essential Love Songs of Philadelphia continues with “Naima” from John Coltrane’s 1960 album Giant Steps. Music comes in when words fail, and nobody knew that better than John Coltrane. The iconic saxophonist burned bright across a turbulent life where he struggled with addiction, relationships, spirituality, and the tension between artistic vision and the cold demands of a capitalistic society — all topics that leave those ensnared speechless. Fittingly, two of his most enduring works unpack the complexities of love to the sound of saxophones melodies sweet, somber, and spectral. 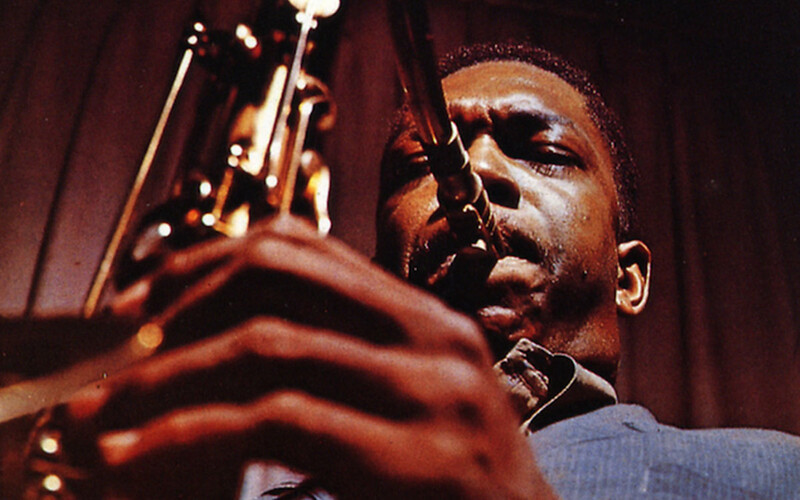 John Scheinfeld’s 2016 documentary Chasing Trane places the musician’s creative and personal zenith at the January, 1965 release of A Love Supreme, a euphoric, exaltational song cycle about Coltrane’s relationship with God and, by extension, the spiritual life of humankind writ large. At the point of its recording and release (which happened, amazingly, within one month of one another), Coltrane had been living sober and wholly dedicated to his music for eight years, and was wrapped up in a love affair with his pianist Alice McLeod, who would later become his second wife. By contrast, the song “Naima” from his 1960 Atlantic Records debut Giant Steps — arguably Coltrane’s first great love song — captures a much more difficult time in his life and the love that emanated from it; a sort of love that’s sad, delicate, fraught with trouble, but no less profound. The song is a dedication to Juanita Naima Grubbs, Coltrane’s first wife, who he met in 1953 through his friend and later bandmate Steve Davis. It was a frantic time in Coltrane’s life; he was living in Philadelphia, picking up gigs as a sax-player-for-hire with local R&B bands playing neighborhood bars, all the while studying jazz theory with guitarist Dennis Sandole. He was also drinking heavily and using heroin, two habits that had previously cost him gigs in touring combos with band leaders like Dizzy Gillespie and Johnny Hodges; these habits amplified in 1955 when he joined the Miles Davis Quintet and was furiously darting back and forth between New York City and Philly to balance his work, and his life with Naima, who he had married in 1955. Coltrane went home to Philadelphia and — like Miles himself at an earlier point — made the decision to clean himself up, and to do it on his own. At his mother’s house, he lay down in a bedroom and instructed his wife Naima to bring him only water while he went through the agony of kicking both heroin and alcohol. His resolve at the end of the experience was a dedication to clean and compassionate living: “you can improve as a player by improving as a person” to quote another historian, Lewis Porter. And he obviously felt tremendously so indebted to Naima for saving his life that his love for her was enshrined in song via this composition, written in 1959 and recorded the following year for Giant Steps, a point at which the Coltrane family was now fully living in New York. From the opening C note, softly bending over an airy expanse, it’s clear “Naima” is not a celebration of jolly romantic sentiment. It is sad and somber; the breathless feeling of Coltrane’s phrasing no doubt echoes the exhaustion he must have felt waking up in a Philadelphia bedroom, covered in sweat, exhausted at the end of a traumatic race for his life. It also echoes the exhaustion the title character must have felt as she cared for and cleaned up her companion; a person who put emotional stress and strain on her life, but somebody who she nevertheless loved deeply and chose to be with. In the wistful notes of this four and a half minute song, punctuated by the understated bass playing of Paul Chambers and a gentle piano solo from Tommy Flanagan, you feel the tenderness of a warm embrace between two people who have been through hell together, who are unsure if their stories will continue to move in parallel, but who nonetheless share a deep devotion to one another and know that, for the moment anyway — that one, disheveled, melancholy moment — the best thing they can do is try to be their best selves for one another. Even though Coltrane and Naima’s story did not end happily, his tribute to her endures. Between its initial release on Giant Steps and his death in 1967, the saxophonist re-recorded it a dozen times, and in the ensuing sixty years, it has become a jazz standard, with cover versions recorded by some 34 artists from Art Ensemble of Chicago and Herbie Hancock to Victor Wooten and George Benson, and is in the repertoire of countless other players. These versions can bring their own personal emotions and baggage, or lack thereof, to the melody, and that’s fine; but for Coltrane, and the original “Naima,” it will always be a snapshot of those difficult months in Philadelphia in the spring of 1956, where he was ultimately saved by love.